Meanwhile, Rasahaad Penny didn't get a carry for the first time this season and didn't appear to see the field for even one offensive snap. What happens to the first-round RB? He should figure to at least have a significant role sparing Tyler Lockett as the team's kick returner. A Seahawk running back has rushed for at least 100 yards in three consecutive games. That fact may be surprising to the rest of the NFL. But as for the Seattle locker room? Despite missing the Cardinals game with a hip injury, Carson has showed it in four games this season, rushing for 293 yards, 4.6 yards per carry and a touchdown. He has also been complemented by veteran Mike Davis, who added 68 rushing yards, 5.7 yards per carry and a touchdown in Sunday’s loss. Behind Carson and Davis, the Seahawks have begun to establish a bruising offensive identity. Still, Carson and Davis’ tough running wasn’t enough on Sunday. But that doesn’t mean the Seahawks’ offense didn’t continue to make positive strides. With Carson and Davis ably handling the tailback duties, there was nothing left for first-round pick Rashaad Penny, who did not get a carry for the first time this season (and didn’t appear to set foot on the field for even one offensive snap). 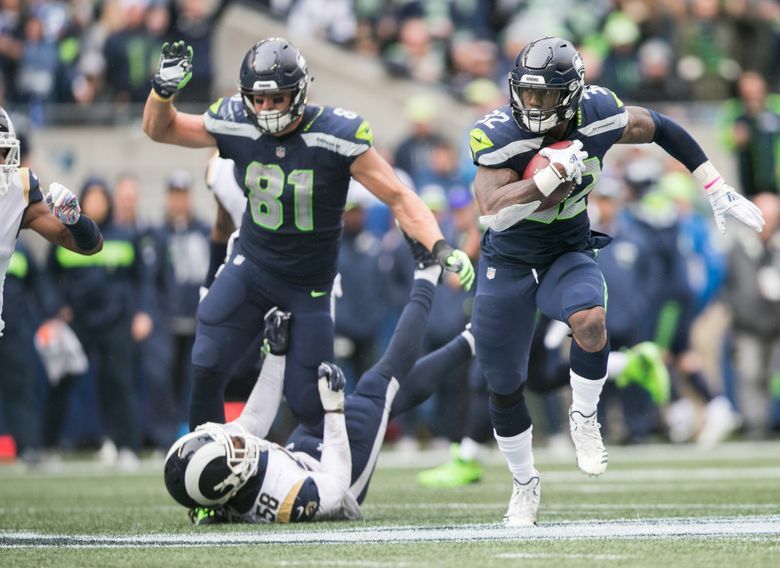 Penny, though, figured to at least have a significant role as the team’s kickoff returner, something he had taken over last week at Arizona, in part to save some wear and tear on Tyler Lockett, who is playing more than ever as a receiver, and whose role there is as vital as it’s ever been with Doug Baldwin still rounding into form. But after the first kickoff Penny tried to field bounced inside the 10 and then into the end zone for a touchback the Seahawks went back to Lockett. Seahawks coach Pete Carroll said later it wasn’t so much a statement of anything Penny didn’t do but instead a desire to have the more-experienced Lockett handle those duties on a day when he said Seattle was unsure what tricks the Rams might have up their sleeves. The game was the first for veteran Cairo Santos as the Rams’ kicker after he was signed during the week with regular Greg Zuerlein injured. “We were concerned that we didn’t know how the guy was going to kick the ball,’’ Carroll said. “He hadn’t played in a couple of years (Santos last kicked for the Bears last November). The ball he spun down there was bouncing around. Santos had three touchbacks on seven attempts. But Lockett was able to pick up one short kick at the Seattle 8 and return it to the 50 to set up a touchdown in the second quarter and David Moore also corralled one short kick at the 21 and return it to the 39 to set up a field goal shortly before the half. That Penny didn’t play offensively won’t quell the debate that has raged about his selection in the first round. Carson now has 293 yards on 64 carries and a 4.6 average in four games this season — sitting out last week with a hip issue — while Davis has 172 yards on 36 carries and a 4.8 average, also in four games. Penny, meanwhile, has 92 yards on 29 carries and an average of 3.2. The Seahawks’ blocking tight end on Sunday measured 6-foot-5 and 322 pounds. Last week, George Fant was an offensive tackle. But a season-ending injury to rising rookie Will Dissly forced a sudden change of plans. But is it possible Fant may have more to show? Will the tackle-turned-tight end be running any routes in the near future? “I’m going to keep that under wraps … but whatever they need me to do,” the versatile Fant said with a deceptive grin. Either way, it appears the third-year player from Western Kentucky will welcome any role that allows him to see the field. And on Sunday, Fant’s contributions helped yield 190 Seahawk rushing yards and 5.9 yards per carry. “It feels great, man,” Fant said. “We’re just putting the league on notice. We’re going to run the ball, run it down your throat. We’re big and physical up front. We’re going to hit you from the first quarter to the last.